Phact: the phantom takes the bite from the MacIntosh and looks out the Windows. Phact: fool a man - shame on you. Fool a superior - well, just don't fool a superior. You can never fool the phantom. Phact: the phantom's second-favourite dish is roasted snake feet. His favourite is fried fish lungs. Phact: the phantom can defeat himself and win. Phact: the phantom once flew to the sun. How did he manage the temperature? He flew at night. Phact: Sauron has only 9 fingers because Isildur chopped one off. He only has 1 eye because... well, let's just say he had a staring contest with the phantom that did not go well for him. Phact: the phantom once gave Eru and the Ainur some hallucinogen drugs. The result was the creation of Ea. Phact: Tolkien invented the legendarium. the phantom invented Tolkien. Phact: Gandalf can make ring shapes out of smoke, but only the phantom, when smoking a pipe, can make Gandalf shapes. Phact: when Beren confronted him, Carcharoth snapped his jaws around his hand. When he came across the phantom, he tried to do the same trick. As a result Carcharoth suffered severe toothache for the next seven years and lost more than several teeth. Hmm. xed with some highs. I thought he wore the mackintosh. Wearing something with a bite in it?! the phantom?! Hey, he took the bite out of it. It was probably a trophy, like those necklaces made out of ears. Phact: the phantom never wears a mac in the pouring rain. And it's not strange at all. Phact: whoever says that perfection in impossible has never met the phantom. Phact: the phantom lives longer than anyone around him. How can we prove that? Easily! February, in the phantom's calendar, always has 30 days. Phact: people only decided on the ∞ sign for infinity after they all failed to draw the phantom in all his perfection. Phact: the phantom can enter and leave the Halls of Mandos at his pleasure. Phact: there will never be a story/film titled "The Return of The Phantom", because the phantom has never left in the first place. He is always here. Phact: The Phantom never lies. If he says something that differs from the truth, well, truth better change itself quickly. Phact: there are two basic rules in life. 1) the phantom is always right. b) if he is wrong, see the first rule. Phact: the ice ages occured when the phantom visited a different galactic and left the Earth without his effulging presence. Phact: it is said by the hobbits that uppon Saruman's death his spirit rose from his dead body, but a wind from the West blew it away. What is not said by the hobbits is that the phantom just happened to sneeze a few miles away. Phact: Using the Ring, Sauron can read the thoughts of other Ringbearers. the phantom doesn't have to use anything to read anyone's mind. Phact: the phantom can judge a round of Taters to Taters and win that round. The amount of hot air can provide huge head in phantom calories per Charles Hobbit house, in the next decade. Now that is a Phantom Phact- a posting without equal on this thread! What a coincidence! I came to this thread specifically to point out that– phact– the phantom is *clearly an overgrown Jawa*. The resemblance is remarkable, I think you'll all agree. 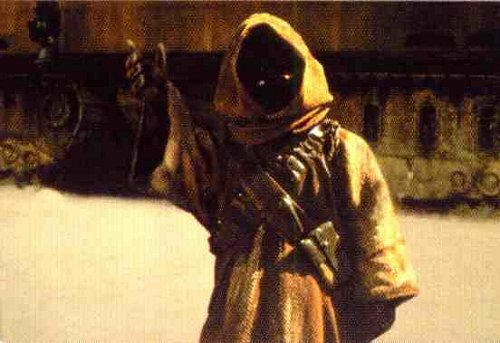 Indeed, Jawas began to dress this way after the phantom graced Tatooine with his presence. Phact: the phantom is the reason palantirs can talk to each other. Phact: the phantom once forgot to put his lunch leftovers in the fridge. The resulting growth became the universe. Phact: The way is shut. It was made by those who are Dead, and the Dead keep it, until the phantom comes. Phact: I'm going to phail my midterm... If only they would test phacts instead of facts!